EU plans for member states to accept 160,000 new asylum seekers are only a first step in solving the migrant crisis, Germany's vice-chancellor says. Sigmar Gabriel said 450,000 people had arrived in Germany so far this year, with 37,000 in the first eight days of September. Tens of thousands, mainly Syrians, have pushed north in recent weeks. Serbian TV says a record 5,000 migrants have arrived at the border with Hungary in the past 24 hours. The Hungarian army earlier started military exercises to prepare for a possible future role in guarding the border and stem the flow of people - a move criticised by human rights groups. Meanwhile, Austria's government said 5,700 people had crossed over from Hungary in recent hours. National train operator OeBB temporarily suspended services from Hungary because of the increasing numbers and the risks of overcrowding. A correspondent on the Hungary-Serbia border says refugees are being kept in a miserable, wet and muddy holding zone, with volunteers describing conditions there as a "disaster". 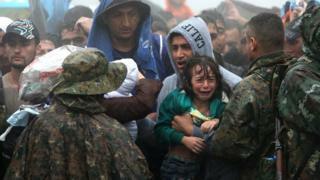 Inclement weather conditions were also reported in northern Greece, forcing officials to allow at least 7,000 people, including many young children, to pass into neighbouring Macedonia. On Wednesday European Commission President Jean-Claude Juncker announced plans to distribute 120,000 refugees from Greece, Italy and Hungary among member states via binding quotas. This would be on top of a proposal in May to share 40,000 refugees from just Greece and Italy. Speaking in the German parliament, Mr Gabriel described the plans as "a first step, if one wants to be polite". "Or you could call it a drop in the ocean," he added. Europe migrant crisis: Are you affected? Thousands of migrants, many of them fleeing conflicts in countries such as Syria and Libya, continue to make the dangerous journey to Europe's shores across the Mediterranean. Syria's Information Minister Omran al-Zoubi said in rare comments on the issue that Europe should bear full responsibility for the crisis, adding that most Syrians who had left were fleeing areas held by the government's rivals, including Islamic State (IS). He criticised European countries for sending "terrorists" to his country, referring to the thousands of Europeans who have travelled to Syria and Iraq to fight with IS. In a separate development, a group of 2,500 migrants boarded a ferry hired by the Greek government to transport them from the island of Lesbos to the mainland. The El Venizelos once carried tourists on the leisure routes of the Aegean and the Mediterranean. That was before the wars in Syria, Libya, Afghanistan sent tens of thousands of people in the direction of Europe. I am on board the Venizelos with 2,500 refugees. They include many families with young children who crossed from Turkey in rubber boats and spent several days queuing for the ship in the stifling heat. It was the quiet of the waiting crowds this morning that was most striking. They filed aboard in orderly lines - the sick and the elderly going first - and then lay down wherever they could. Many were asleep within minutes. As the dawn came up, scattered groups had gathered along the ship's railing. I met an artist from Aleppo, Givara Hesoo, who was heading for Germany with his wife and three children. "Everything is lost," he said. When I asked him about his family's future he replied: "We cannot talk of a future yet." The European parliament backed Mr Juncker's plans on Thursday and they will now have to get the go-ahead from member states. Foreign ministers from the Czech Republic, Hungary, Poland and Slovakia - whose leaders have rejected the migrant quotas - are due to meet their German and Luxembourg counterparts on Friday to discuss the crisis. The Czech foreign ministry said it was aimed at improving "better mutual understanding among EU member states...(in light of) some differing views". German Chancellor Angela Merkel earlier said she hoped newcomers would integrate with the help of their children learning German in school after visiting a home for refugees in Berlin. Can the EU overcome rifts? Many migrants are trying to travel through Hungary to Germany, Austria and Sweden - wealthier EU nations with more liberal asylum laws. Separately, Hungarian prosecutors have opened a criminal investigation into a camerawoman who was caught on camera kicking and tripping up migrants near the border with Serbia. The video of Petra Laszlo kicking a young man and a girl, as well as sticking her leg out to trip a man, sparked global outrage. Lyse Doucet at Macedonia-Greece border: "Ahmed & cousins from #Aleppo hoping to find body of brother who drowned in #Greece." Anna Holligan at Roszke on the Hungarian border: "Relentless flow of people.. #Hungary's response, send in the troops"
Bethany Bell in Nickelsdorf, Austria: "Bottleneck to get on buses at Austrian border. Families trying not to get separated. Buses all going to train station"
Meanwhile Denmark's police chief says his officers have been ordered to let migrants travel freely through the country without registering if they do not want to seek asylum there. Denmark suspended all rail links with Germany on Wednesday and temporarily closed a motorway after police stopped hundreds of migrants trying to reach Sweden at the border.